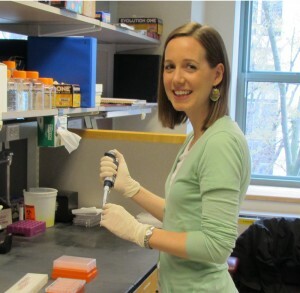 Elsa Beyer Krall, Ph.D., Dana-Farber Cancer Institute, in the laboratory of William Hahn, M.D., Ph.D. While tumors are generally classified by the tissue in which they arise, for instance breast versus lung, advances in cancer genomics have increasingly allowed for the identification of the specific genetic alterations in a given tumor. The success of some targeted therapies have further argued for classifying tumors by mutation status and choosing treatment strategies accordingly. Rather than focusing on cancers in a particular tissue, this project centers on cancers with inappropriate activation of the STAT3 protein. Because STAT3 itself has been difficult to target therapeutically, the study aims to identify other weaknesses in these cancers that may be more “druggable” targets. This study will involve several hundred cancer lines from different tissue types, allowing us to determine how common STAT3 activation is different types of cancer and to identify novel drug targets in these tumors. Jurre Kamphorst, Ph.D., Princeton University, in the laboratory of Joshua Rabinowitz, M.D,, Ph.D. Tumor cells make specific metabolic adaptations to supply the energy and building blocks for their rapid growth. Research in recent years established that one function of oncogenes is to induce these metabolic adaptations. Interfering with cancer cell metabolism is one of the oldest pharmacological approaches to cancer therapy, but is currently limited to the areas of folate and nucleic acid metabolism (e.g., methotrexate and 5-fluorouracil). Recently, Drs. Jurre Kamphorst and Joshua Rabinowitz found, using state-of-the-art mass spectrometry, that the Ras oncogene reprograms fatty acid metabolism. They will now have the opportunity to further investigate the nature and ramifications of this reprogramming, aiming towards finding novel therapeutic approaches that selectively inhibit Ras-driven tumor growth. A particular focus will be on the devastating Ras-driven disease, pancreatic cancer. 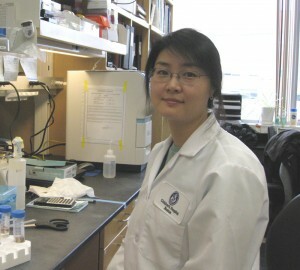 Joo-Hyeon Lee, Ph.D., Children’s Hospital Boston, in the laboratory of Carla Kim, Ph.D. Lung cancer is estimated to cause 160,000 deaths in the United States each year, a number that has remained unchanged after decades of cancer research. As a disease, cancer involves not only the tumor cells themselves, but also their surroundings, referred to as microenvironments. While this concept is accepted, many cancer researchers do not consider the tumor microenvironment idea in their experimental approaches. 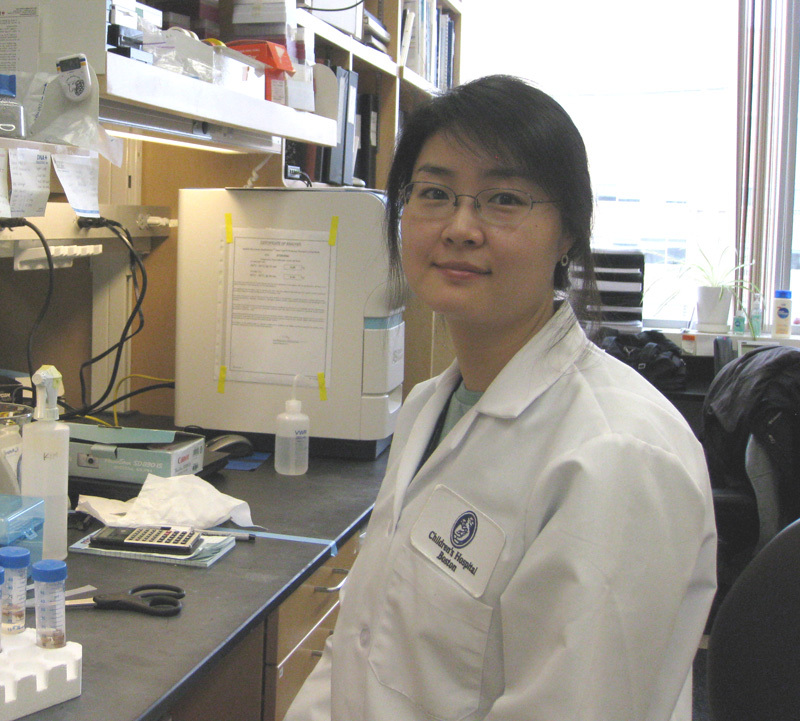 Dr. Lee is working to bring new technological approaches to lung cancer research by working to understand the role of the microenvironment and the molecules that regulate lung tumor growth. Using new techniques she previously developed, her work will help to determine which of the many mutations identified in human cancers are truly important therapeutic targets. 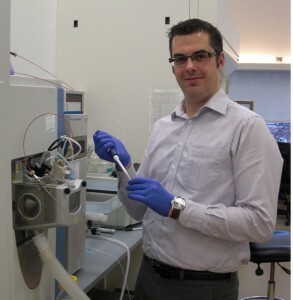 This work will accelerate the discovery of novel therapeutic strategies for lung cancer patients.